For four days each May, the grounds of the Royal Hospital in Chelsea come alive with the sights and smells of the finest collections of flowers in the world. On Tuesday 25 May the judges handed out dozens of medals from the coveted gold through to bronze. There were honours for a waterless water garden and one for a display representing a bowl of rhubarb crumble and custard. This year proved to be a ‘sellout’ event and a feast for the senses of all garden lovers. The Unexpected Gardener, a small urban garden created by innovative charity Thrive with award-winning designer Jo Thompson, is proof that age or disability need not mean an end to the joys of gardening. The garden has been designed for a more mature person who may find gardening physically challenging but is reluctant to compromise on style. Combining practicality with visual appeal, this colourful garden incorporates raised planter beds, an outdoor fireplace, a fountain and a seating area. Featured plants include Iris ‘Jamie Roo’ and a delightful and rare Geranium ‘Southease Celestial’ alongside rich caramelcoloured roses and sumptuous blue and purple irises, and other plants grown by Thrive’s disabled gardeners. 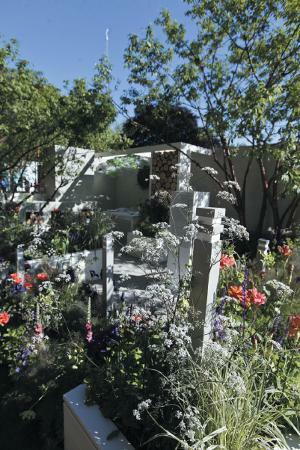 The Daily Telegraph won the Best Show Garden Award. Designed by Andy Sturgeon. Inspired by travel, this contemporary gravel garden brings together flavours of the Southern Cape, the maquis shrubland of the Mediterranean, the chaparral of California and Mexico and the matorral of central Chile. Corten steel screens slice through the design, fusing architectural and sculptural qualities to define spaces and control views within the garden. Open clearings of sparsely planted gravel provide places to pause on a journey that culminates in a courtyard at the rear, where the shade of a stately cork oak and the sound of running water combine to create a contemplative retreat.